or needs. She can assist in identifying your pet's individuals grooming needs. In addition to grooming, Randi is an avid animal lover and has been around dogs all of her life, training and showing them since she was a young back in 4-H.
We always suggest bringing your puppy in for grooming at an early age. The earlier you start the better in the long run. Even if your puppy doesn't need a haircut or anything, bringing him or her in for just a bath and nail trim will help get your puppy socialized to the grooming process and make things less stressful on them in the long run! Keep up the care at Home! Depending on your breed of dog there is still grooming maintenance that needs to be done at home. If you have a long haired or thick coated breed regular brushing (to the skin) can mean the difference between needing to be shaved completely down at your next appointment or getting the cute puppy cut you want! Even short haired breeds need to have their nails routinely trimmed! If nails are allowed to get too long it can actually affect the way the dog walks. Maintain a regular Grooming schedule! Most grooms last 6-8 weeks (depending on the groom). If you like a particular cut then the dogs need to see the groomer on a regular basis. Going too long in between grooms can affect what the groomer is able to do based on the condition of your dog! 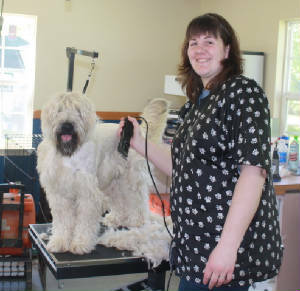 We offer full grooms, bath & brushes, breed standard grooms, shave downs, trims ups, etc. All dogs will have their ears cleaned and nails trimmed. We offer FURminator - shedless treatment which severely cuts back on shedding. $10 walk-in nail trims (please call to see if we are open). All dogs are washed in warm water and receive fresh towels in their crates while drying. All towels and crates are thoroughly washed before use. All grooming equipment is sanitized between dogs. Drinking water can be offered if needed. For more information or to book your dog's next appointment please call (586) 752-3976.